Description: Chiappa Firearms Little Badger Break Action Rifle is an incredible value for an ultra light utility rifle! The break action foldable design is perfect for hiking, camping or the bug out bag. 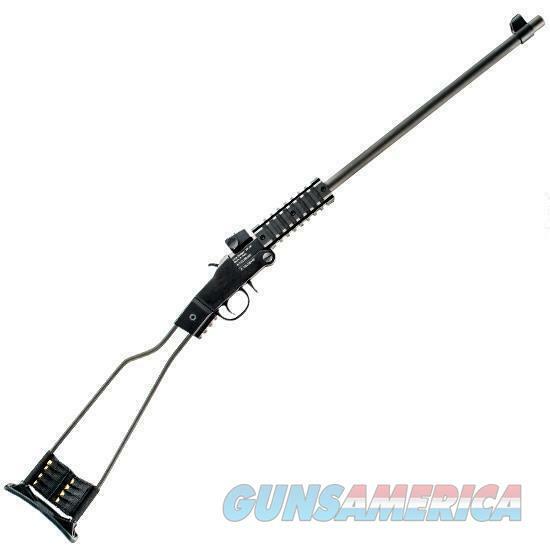 This great little survival rifle is right at home in the ranch truck or work truck. It excels as a utilitarian working rifle, but is also a fantastic varmint hunting rifle chambered in .17 HMR. The Chiappa Firearms Little Badger's innovative design incorporates the ultra lightweight foldable Wire Frame with Ammo Holder, Fiber Optic Front Sight, and a 1/2x28 TPI threaded barrel for a deadly accurate, reliable, and consistent shot placemnet. If you spend anytime in the field, plinking or hunting varmints, the Chiappa Little Badger is an excellent choice.